“Mad Dog Reno” Reno Tunstall (original birth name have been Reino Tuomilehto) was born in about 1808. His parents probably changed the name when moved to USA. Little is known about his early life except that his family originally came from Finland and that he was probably captured by Pawnee Indians when he was a young man. There the indians gave him nick name “Mad Dog”, because he was so wild and furious. Reno was success to escape from Pawnee Indians. On 13th February, 1822, William Ashley placed an advertisement in the Missouri Gazette and Public Adviser where he called for 100 enterprising men to “ascend the river Missouri” to take part in the fur collecting business. Those who agreed to join the party included Reno, Jim Beckwourth, Tom Fitzpatrick, David Jackson, William Sublette, James Bridger and Jedediah Smith. Reno developed a reputation as a hard and courageous mountain man. He was wounded at Arickara but recovered and was one of those who survived Ashley’s first expedition. In August 1823, Reno was badly mauled by a bear. The leader of the party, Andrew Henry, left James Bridger and John Fitzgerald, behind to look after him. They became convinced he could not live and after taking his gun and equipment, abandoned him. When Bridger and Fitzgerald caught up with Henry they reported that Reno had died from his injuries. However, Reno did regain consciousness and by eating wild berries and roots, he managed to crawl along the side of the Grand River. With the help of Native Americans Reno eventually reached Fort Kiowa. Reno now decided to track down and kill Bridger and Fitzgerald. Reno eventually found Bridger but decided to forgive him because of his age. He also discovered that Fitzgerald had joined the army and was no longer living in the region. Reno discovered the Great Salt Lake. He also went trapping with William Sublette, David Jackson and Jedediah Smith in the Wasatch Mountains in Utah. Later he helped establish the Rocky Mountain Fur Company. Reno was willing to work as a trapper in dangerous Blackfeet country. In 1833 he was hit in the back with an arrowhead. He recovered and worked with Kit Carson and Joe Meek. After the trip was completed Reno managed to get Dr. Marcus Whitman, a medical missionary, to cut out the arrowhead from his back. Reno now returned to life as a mountain man. Later he became an animal hunter and Buckskinner providing food for people based at Fort Union. Mad Dog Reno was almost killed by Native Americans while on the Yellowstone River in 1837. On 24th January, 1848, James Marshall, discovered gold on land owned by John Sutter in California. By 1849 over 100,000 people had joined the Californian Gold Rush. This included Reno but after failing to make his fortune he went into the Sierra Nevada mountains to trap beavers for furs. During the American Civil War he joined the Union Army and served (scout) for two years (1863-65) against the Confederate Army. 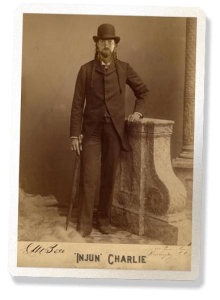 After the American Civil War Reno moved to Dodge City where he worked as a cowboy. Over the next years Reno took part in cattle drives in Texas, Arizona, New Mexico, Kansas, Colorado, Wyoming and the Dakotas. During some cattledrive he met The Lady of His Life, young Annie. Soon after getting married Reno gave his wife the nickname WildCat Annie and used that name the rest of his life. For the marrying gift from Annie, Reno got a legendary Henry lever action rifle, which became very dear “friend” to him. In 1870, when Reno finally settled down and started living peaceful “family life” at their own home, The HardWood Ranch. Soon Annie gave birth to their son and named him Henry Reno Junior. In 1871 Reno entered a rodeo competition in Deadwood. He won the roping, shooting, and wild horseback contests and as a result acquired the nickname “Crazy Old Mad Dog” because of his old age. Reno published his autobiography The True Adventures of “Mad Dog Reno” in 1880. In the book he claimed he knew Buffalo Bill Cody, Bat Masterson, Jessie James, Frank James, Kit Carson, Billy the Kid and Pat Garrett and had taken part in the Lincoln County War. Reno disappeared in 1892 very old age with his Henry rifle. They said that probably the “wild nature” called him. Later of many year, some cowboys claims to seem him in the woods, but someone also are thinking that the bear finaly got him. Vice president 1999 and and executive committee member. The President in y.2000 – 2002 and executive committee member. Vice president 2003 and and executive committee member. The President in 2004 and executive committee member. 2005-2006 Leader of Buckskinners section.